Motiga and Perfect World launched the first major update to action MOBA Gigantic today. Titled “Exile in the North”, this update adds new features to the free-to-play game including a new Hero, new skins, and new weapons. There are also several improvements impacting gameplay and quality of life. The new Hero is Pakko, a love-able (frost?) giant filling the role of melee/tank. 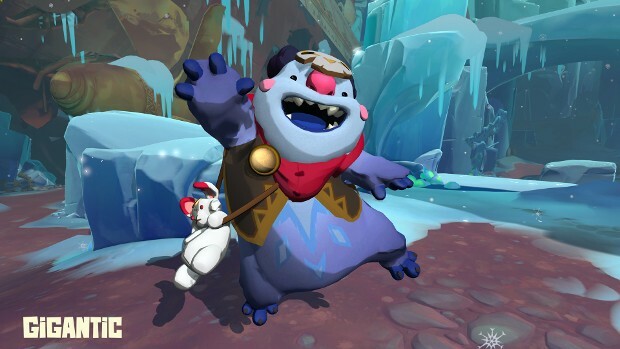 Pakko arrives with an alternate winter-themed skin. In addition, Wu and Tripp also receive two new winter skins each — as well as winter-themed skins for their weapons. In the area of gameplay improvement, end-of-match Crown Boosts and Honor Bonuses for shorthanded teams are being implemented. Full details on all of this are available on the Gigantic site.